team small dog: I believe it's name is Xanax and a cocktail. I believe it's name is Xanax and a cocktail. So at the dog agility mudsquish the other day, was standing outside a ring, vacantly planning a course for point collecting in the Jackpot class. CPE's version of Gamblers. A dog agility lady I know sidled up to me to say hello. The usual, "Wow, you drove All the Way Up Here for just one day?" The other one I get is, "I didn't know you did CPE?" Yep. I always just come on Sundays and I go to a few CPE's every year. I do dog agility different than a lot of people but it works for me. So she starts to give me a run down of the previous 2 days of classes. Show started on Friday afternoon and was a long day on Saturday. Weather, not too bad. Looking like rain today, so watch the drips because the roof leaks. And, she comes in with a hushed low voice, "There's a lot of AKC people here today." There is sort of a raised eyebrow sidelong glance with this. Maybe an eyeball left right immediately preceding it, just to see who's nearby. You know how. Like those paintings in the creepy spook house on Scooby Doo do with their left right eyeballs. I know there's not a lot of people I know there. There's a few people who go to USDAA and CPE, but not lots. I don't really have a bunch of CPE buddies to hang out with, but I've gone to enough of them to know faces and say hi. But I don't really know who is new and who always comes. Not like USDAA, which is the same cast of characters, except at the really big dog show fiesta level extravaganzas where people come from far, far away. CPE, while I might whinge about the courses or the thing with the Colors, always a fresh group of dogs and faces and a huge variation from border collie border collie border collie border collie sheltie. There's about every type of dog you can imagine, including other Otterpop types, who kind of sticks out at USDAA. Otterpop, sort of a basic CPE breed. So you know, if there is some person just sitting there, setting bars or working at the gate, and not talking, guess what, they can still hear you talking. That's right. So your conversation there, 3 feet from me, is perfectly audible and I get to hear your MACHspeak. Double Q's. Nineteen bucks. How you feel about border collies. How you feel about certain competitors. Learned some AKC things for sure. How much you hate Angelina Jolie for being so skinny in her vampira gown with her perfectly placed tattoos. Oh wait. That wasn't at dog agility. But really. Who engineered Brangelina? I wonder if Mickey Rourke would ever take his pack of dogs to visit their pack of kids in their castle? Did you see last night, he was wearing a Loki the Deceased Chihuahua necklace with his totally unhinged untuxedo? So wait. That's not what I meant to tell you about. I meant to tell you about a lady I kept seeing. Have no idea what venue is her personal preference. But not a lady I've ever seen before. I did a lot of gating there, at the dog show. To stay out of the rain, and I don't mind running the gate. Gate people, my non dog agility friends, you are the one that lets people in that ring. You have a list. Everyone is on it. Everyone will get in that ring at some point. Not like we're at some pukey, sweaty smelling club in Hollywood and only SOME people getting in. Everyone gets in. Not a red carpet Oscar event, people. Except some people, just FREAK OUT about it. Sometimes I wish I was like David Letterman when I was running the gate. I wish I was David Letterman all the time anyways. And I was doing a sociological experiment the whole time. An experiment which is super funny to everyone except the experimentee. I think the other guy running the gate, the booming voiced cowboy in tights and galoshes, I think he was experimenting. But I just gated. I try to keep a calm, yet funny gate. Because GAWD is it stressful up there at the gate. And I am your friend. 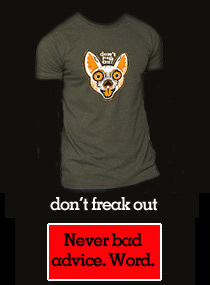 I want you to not freak out before you run your dog. I would say in CPE, overall, WAY more freaking out at the gate than in USDAA. You guys are super interesting, my little experiments, up there about to run your dogs. I like to listen to you. And notice, in a first hand, in your face way about how you deal with your pre-run, this Moment Before the Momentous Occasion of Your Life Called You are About to Run Your Dog Around an Important Course. Hold the Batphone! Momentous! Not everybody. Some of you? Just calmly hanging out, chit chatting with friends, not really even noticing your dogs. Some of you? Sort of hanging out with your dog, focusing, watching, tugging, found a nice little calm spot to get ready. But some of you? A little bit, um, frantic. Some of you are this one lady. She had a non traditional breed. Maybe let's just call it, for our purposes here, Non Traditional Agility Breed Dog. Because if I tell you what kind of dog it is, Hi! I didn't know all your friends read this and all of a sudden Team Small Dog, Mean and Eavesdropping Noticer of Your Weird Habits and Stay Away From Laura! She will Write A Mean Story About You! This lady, very crabby about how I dealt with gate conflicts. Pretty much, if you are having a conflict, I want to help you. Sometimes I run 4 dogs at dog agility. I get your conflict pain. I will help you. I understand your motorhome is on a far, far away planet and your dogs must be shuttled back and forth. Or that your other dog runs in another ring. Or you were working somewhere and didn't get to walk the course. Sometimes people with one dog in one ring, they do not feel your pain and do not like someone Messing With the Law, when the law is a print out listed order of which dog runs when. And when that law is violated and a dog goes in front of them, Holy Law of God Broken! What did they vote on Proposition 8? Being a commie homo loving sunuvagun, I will find a way to fix it at the gate. Non Traditional Agility Breed Lady in your rainpants, life went on. You told me your dog's name 800 times. You asked me 800 times when it was your turn. You whiney shrieked when I moved people around which is aka, accommodating conflicts. You were back there freaking your dog out for so long and good gawd, was your run crazy. And your dog is sort of naughty, which is maybe grounds for extra freaked outness. Potential for disaster out there. There were a lot of good experiments I thought of that I would have liked to try out on you. Like what if I brought in some Rent-A-Nuns and they want to pray for your dog before it's run but must drape your dog with Ozzy Osbourne style jewelry for optimum praying and they start chanting about Satan? Or Martha Stewart comes in with a video camera and needs to interview you Right Now, before your run, about your dog's poop and how you selected your ensemble and what you are doing to combat global warming? But instead. I just keep standing there with my sharpie. Crossing out names and announcing who's coming up soon. Watch you run poor super stressed out Non Traditional Dog out there, and realized that dog, maybe has tough go at it for a while in this sport. And that really. You just want to do well and your probably love the heck out of this dog. But maybe they will feel the love better, if you work out some stress management issues in a positive and healthy way. Or something. She is not talking about me. I wasn't even there. And I have never worn rain pants. And I am always polite to the gate person. Sometimes I do forget and stand in everyone's way. And maybe in the beginning I did ask 80 times if it was my turn yet. And maybe now I'm a little more chatting with friends and forget that I should have already put the ball 12 feet away and gotten on the line because we're NEXT. But otherwise, not me. Whoa, gating! My hats off to you. I've gated only briefly. Called the wrong dog "on the line" when, oops, Rob was on the line. He just sorta looked at me like you obviously don't know what you're doing. It's a very stressful position to fill. I've seen those stressed out people! Too many stories to tell. I feel your stressed out people at the gate pain. And I have the same feeling about CPE, who are all these people? BTW, there are others who do only one day of agility who also get all the incredulous questions. Barb Hasey, whom you've probably never met because she does only Saturdays. Debbie Ogg who does only one day when it's out of town. Sometimes she does CPE, too, but mostly USDAA. And LOTS of others. Like, maybe, none that I can think of.